HUGE thanks to Modern Masters for sponsoring this post. All opinions are 100% my own. Painting doors can be pretty scary and overwhelming for those of us who have never done it before or are just beginners in the whole DIY/home improvement world. I've been excited to learn all kinds of new tricks and skills now that we own a home of our own, and getting our doors painted - our sad, sad garage door especially - has been at the top of the to-do list. I just had no idea where to start. Earlier this year, I learned more about Modern Masters and how easy it is to use. 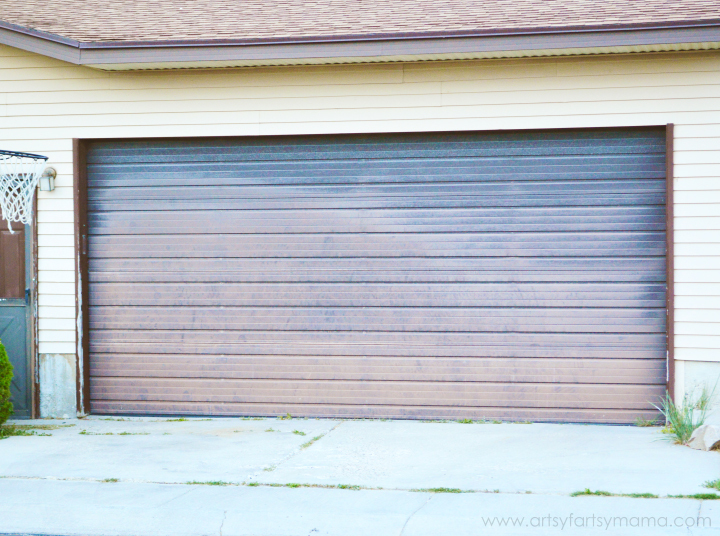 I knew right away that their door paints would be the perfect solution to our garage door problem. 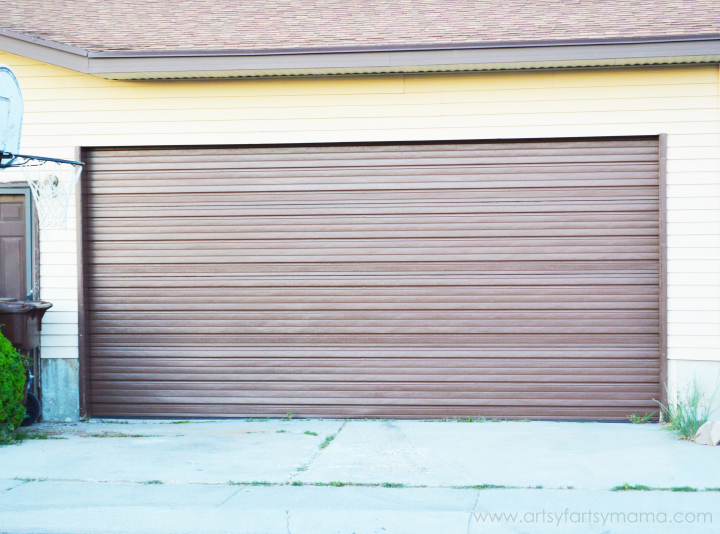 I'm so excited to show you how easy it really is to paint a garage door - and how you can get it done in just a day!! The picture really says it all, but garage door used to be such a huge eyesore and, honestly, kind of embarrassing. It was incredibly faded, and it just looked sad. The paint on the trim was peeling off, and I had my doubts that the garage door could even be fixed with just paint. To keep the same look to our garage, but just *better*, we went the color Ground from their Front Door Paint product line. Modern Masters Front Door Paint comes in 24 colors, all based off of an "Emotional Color Wheel", so there really is a shade for every personality! If you aren't sure what color will look good on your home, you can try out the free app (available on both iPhone and Android) to instantly see how Front Door Paint can transform your door! To prep your garage door, you'll need a ladder, a drop cloth, a paint tray, a paint brush, and a foam roller. The night before, we sprayed the door down and got it as clean as possible. We started earlier in the morning when the sun wasn't directly hitting the door. It helps to have more than one person painting in the beginning - one with the paint brush to get in all the cracks and edges, and the other with the roller to paint the larger areas. 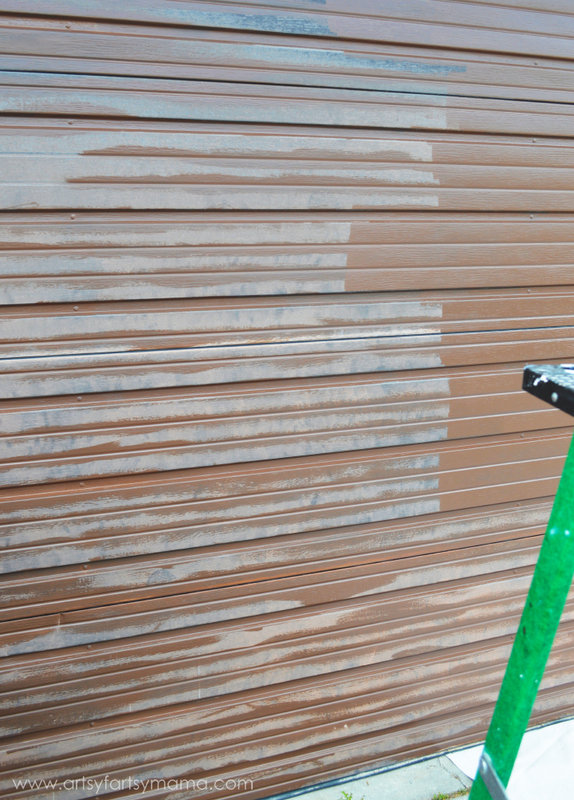 The drop cloth will help prevent the paint from dripping onto your driveway, and it helps a TON if your ladder has an area to hold your paint tray while you work at the top of the door. We painted the door from right to left, top to bottom. Once the door is painted, it helps to open the garage about halfway and then do any touch ups on areas you may have missed in the creases. It took about 2 hours to get the first coat on the door. We took a lunch break, and the paint was dry enough by the time we got back to get the second coat on. The Front Door Paint should cover in two coats, and dries to a beautiful satin finish that will NEVER fade. 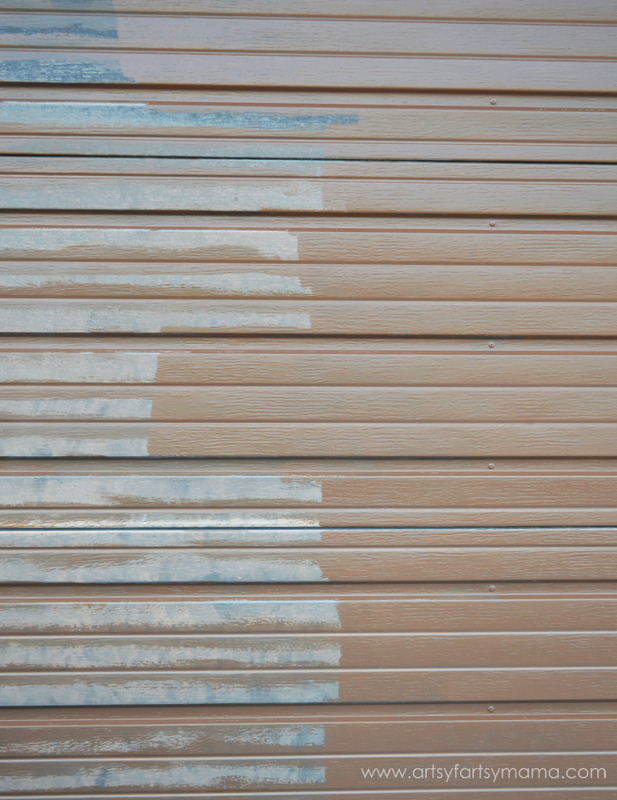 I can't believe the difference the paint made to our garage door and our home. I also painted my front door, so come back soon to see how great it looks! 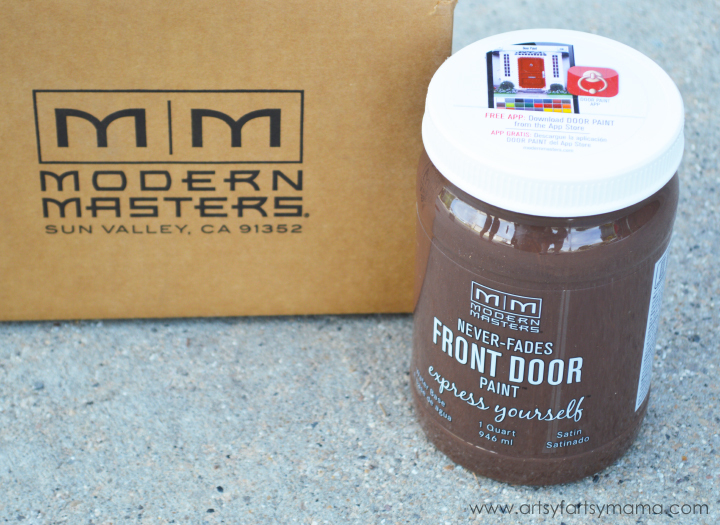 You can purchase Modern Masters Front Door Paint in selected Lowe’s and Ace Hardware stores. It's also sold on Amazon.com and on the Modern Masters Website. They've been adding retailers to their Pinterest Map, so follow them to see if there will be a location selling the paint near you! 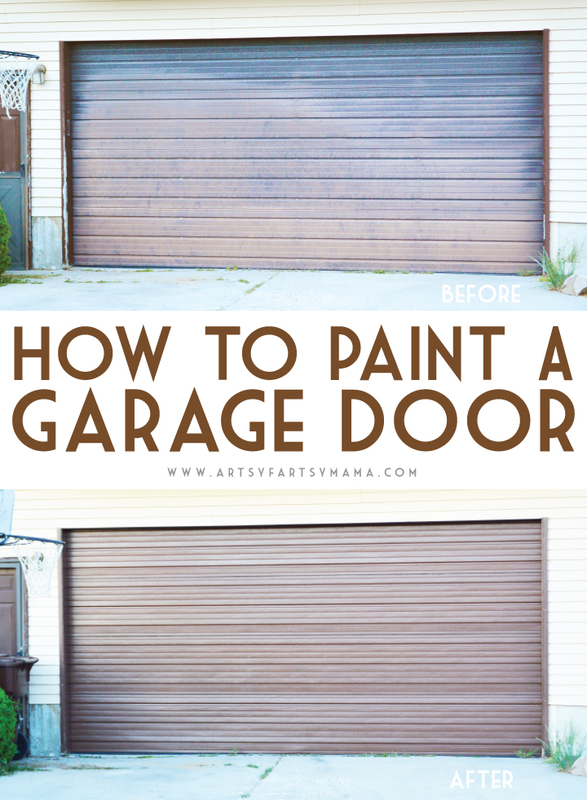 I have always wondered how to paint a garage door. It seems like a scary undertaking but yours looks great! Thanks for the tips! I love MM! The makeover looks amazing! Good work lady! What a great transformation. You guys did an awesome job. What a huge difference the paint makes! wow it looks amazing! Love Modern Masters!! !